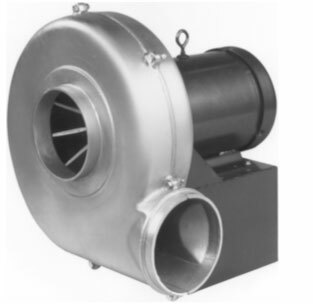 Sales of large industrial high pressure blowers, radial fan ventilators, explosion proof pressure blowers, spark-resistant fans and fiberglass fans - pressure blowers. Engineering of FRP and SST high pressure blower ventilators, OEM ventilators and chemical process pressure blowers and fans. Direct driven fans used in in high pressure pneumatic conveuing systems where air contains dirt, lint, dust, and other foreign materials. Also used for filtered dust collectors and combustion air supply. Heavy duty custom built industrial and process fans blowers and blowing systems in Buffalo, New York. Replacement Twin City Fans / TCF blowers and Aerovent ventilators, Chicago Blower fans, industrial pedestal ventilators, in line fans, confined space fans, in-line exhaust blowers, radial blade fans, paddle wheel ventilators, hvac blowers, high temperature pressure blowers, fiberglass ventilators, stainless steel fan blowers, material handling radial blowers, blowoff fans, direct drive blowers, belt drive fans, air vent fans. Canada Blower FRV fiberglass roof ventilator is designed for roof mounted exhaust applications where corrosion resistance is a primary consideration. The standard Canada Blower FRP resin used for the FRV is resistant to a large variety of alkalis and other chemical agents. When a corrosion resistant fan is required to withstand chemicals that attack glass or polyester resin, special plastic and reinforcing fan material can be supplied ventilating.com fanblower.com highpressureblower.net industrialblowerfan.com industrialfanblower.net industrialfanblower.com pressureblower.net northernindustrialsupplycompany.com industrialpressureblower.com tenderall.com chicagoblowercanada.com cbblower.com buffaloblower.com buffalofan.com nis-co.com canadianblower.com olegsystems.com canadablower.com abbblower.com acmefan.net industrialblower.net fansandblowers.net americanblower.net barryfan.com cincinnatifan.net canadafans.com barryfan.net pennbarry.net pennfan.net tcffan.com.